You'll be £19.99 closer to your next £10.00 credit when you purchase Armies of the Late Roman Empire AD 284 to 476. What's this? Order within the next 8 hours, 5 minutes to get your order processed the next working day! 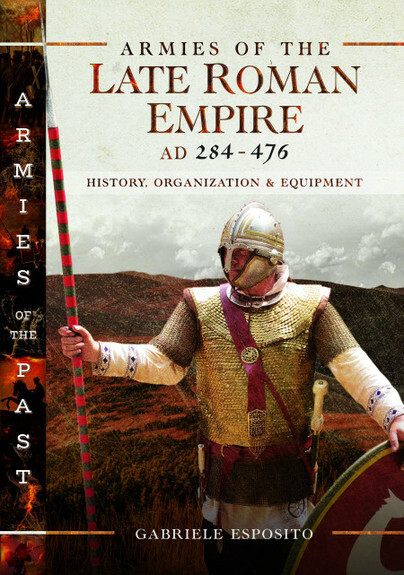 This guide to the Late Roman Army focusses on the dramatic and crucial period that started with the accession of Diocletian and ended with the definitive fall of the Western Roman Empire. This was a turbulent period during which the Roman state and its armed forces changed. Gabriele Esposito challenges many stereotypes and misconceptions regarding the Late Roman Army; for example, he argues that the Roman military machine remained a reliable and efficient one until the very last decades of the Western Empire. The author describes the organization, structure, equipment, weapons, combat history and tactics of Late Roman military forces. The comitatenses (field armies), limitanei (frontier units), foederati (allied soldiers), bucellarii (mercenaries), scholae palatinae (mounted bodyguards), protectores (personal guards) and many other kinds of troops are covered. The book is lavishly illustrated in colour, including the shield devices from the Notitia Dignitatum. The origins and causes for the final military fall of the Empire are discussed in detail, as well as the influence of the ‘barbarian’ peoples on the Roman Army. This is an excellent book, lavishly illustrated with full colour drawings and photographs of re-enactors, showing a vast array of equipment, weapons and even food used by the Roman army in the given period. The book is divided into 4 sections with a couple of appendices. It has a brief overview, two chapters on the major reformations and the final chapter, which is the meat of the book, covers all the various equipment. I have no problem giving this book 5 stars. The combination of helpful images, historical insights, and careful analyses makes this book a highly valuable contribution to the existing literature. Easy to read and would be helpful to those new to the study of the Roman army. If the structure and disposition of Roman armies is your area of interest, it's a vivid and indispensable guide. Gabriele Esposito is an Italian researcher and a long-time student of military history, whose interests and expertise range widely over various periods. He is the author of numerous books on armies and uniforms and is a regular contributor to many specialized magazines in Italy, France, Netherlands and UK.